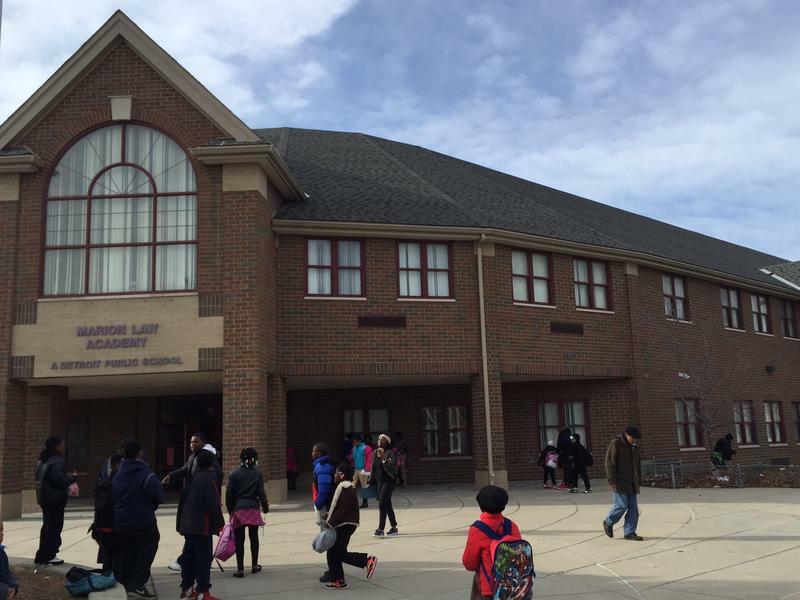 Law Elementary is one of 38 schools the state says it may close by summer. Eugene Brown’s daughter Gniyah goes to Marion Law Academy in Detroit. The school is part of the state-run Education Achievement Authority, but is supposed to be re-absorbed back into the Detroit Public Schools Community District this summer. Gniyah's been going there since kindergarten, she’s in fifth grade now and brings home Bs in math, her favorite subject. You are receiving this letter because [your child's school] is at risk of being closed by June 30, 2017 due to academic failure for many years. For the next 30 days we will work with your local school district and community to finalize this decision. We will be looking at other public school options for your child. If we determine that closing your school would create a hardship because there are no better options at this time, we will not close the school. You will receive an update about the decision by the end of February/beginning of March. So what are these “higher performing” options the state is talking about? Along with the letter, the state also sent a two-page list of possible districts – not schools, just districts – where Brown could send Gniyah if her school closes. “If it does, be honest, I think she’s gonna go across Eight Mile,” says Brown. Brown says he would leave the Detroit Public Schools Community District and go across Eight Mile Road to Fitzgerald public schools in Macomb County, about 12 miles away from where the Browns live. The Fitzgerald school district was on the list of “higher performing” options. Now the state says it only gave parents a list of options that were ranked in the 25th percentile or higher. But according to our research, that’s not true. The Fitzgerald middle school, where Gniyah would go, is not in the 25th percentile; it’s in the 12th percentile. So, sure, it’s a little better than where she was, but not great. In fact, of the 58 districts included in the state’s list for Detroit parents, 33 include schools below the 25th percentile. Because the state’s letter only listed districts, not specific schools, parents have to do a fair amount of research to figure out which schools in the district are better than others. The city of Chicago closed a bunch of failing schools at one point, and research there shows that only kids who went to significantly better schools improved academically. We’re talking 75th percentile, not 12th or 25th. So if the idea is to get students out of failing schools and send them to better ones, that’s a problem. Another problem with the list Eugene Brown got? It includes districts that don’t even take kids from Wayne County. Michigan law allows districts to take kids from other districts, what's known as open enrollment. Open enrollment is optional, though most districts participate and the law stipulates that districts can only enroll kids who live in the same county or ones adjacent to it. 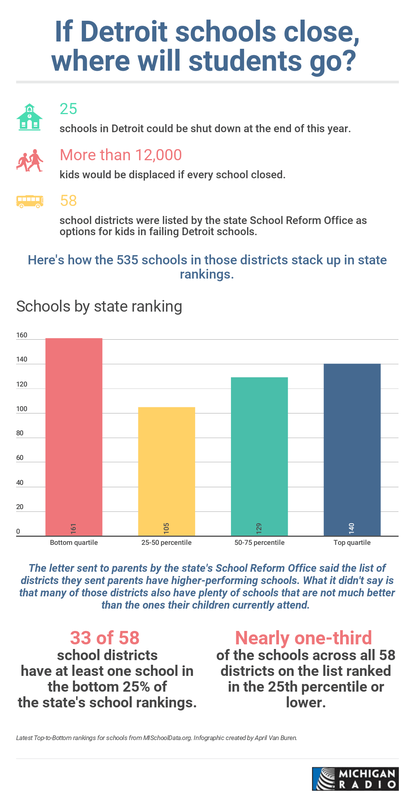 Our friends over at Chalkbeat first reported that the list Detroit parents got from the SRO included districts that don’t take kids from Wayne County, and even those districts that do take Wayne County kids might not have enough seats for them. That’s the case with Fitzgerald’s middle school. I called the district and found out that it has seats available for Wayne County kids for K-2nd grades and high school, but the middle school, where Brown was hoping to send his daughter, won’t be taking any kids from outside Macomb County next fall. State School Reform Officer Natasha Baker is well aware of the open enrollment issue, and she brought it up at a Senate Education Committee meeting two weeks ago. 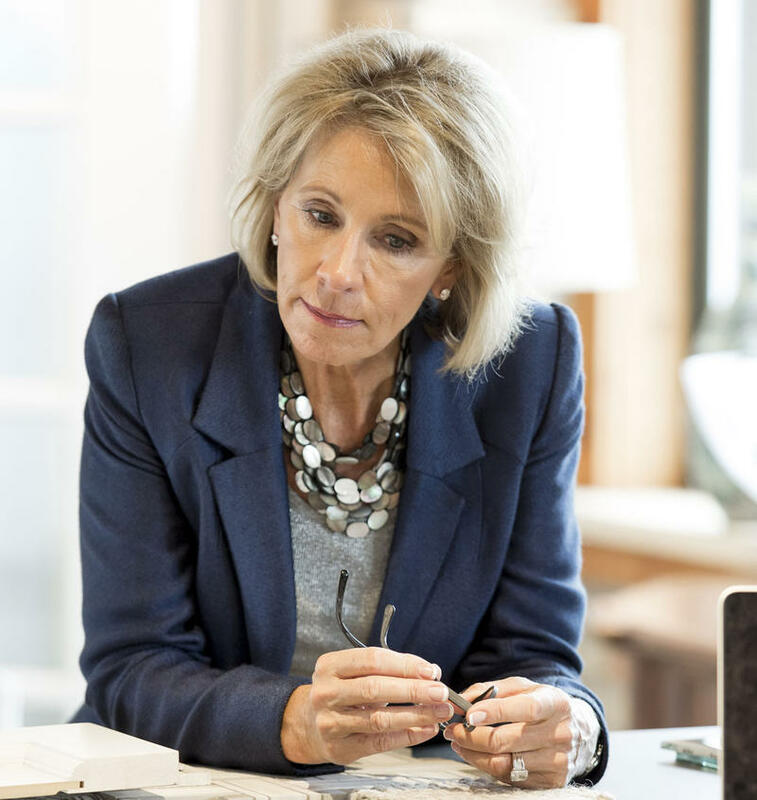 Both she and committee chair, Republican Phil Pavlov, asked if the time has come to expand schools of choice so that kids from struggling districts have access to higher-performing districts. The list that Eugene Brown and other Detroit parents got includes Detroit and other nearby districts, but it also includes districts 20, 30, even 40 miles away. How would parents get their kids to those schools? Parents haven’t gotten an answer to that, and neither have two of the top education officials in the state. Natasha Baker’s SRO office admitted as much to me in an email; they don’t have a transportation plan, or at least not one they’re sharing with the public. Open enrollment is at the discretion of each district, and they do not have to provide transportation for kids who are coming from another district. It’s up to the parents to figure out how to get their kid there; a challenge for many Detroit families where one out of four households does not have a car, according to the U.S. Census Bureau. So, yeah, lots of confusion on this whole roll-out – from lawmakers on down to parents – and anger, too. Districts are lawyering up and lawsuits have been threatened. Everyone’s waiting to see: Will the state actually go through with some or all of these 38 closures? We’re supposed to have an answer by early next month.